Josh McDaniels was supposed to be moving on from New England two days after they lost in the Super Bowl. Josh McDaniels will remain a Patriot. 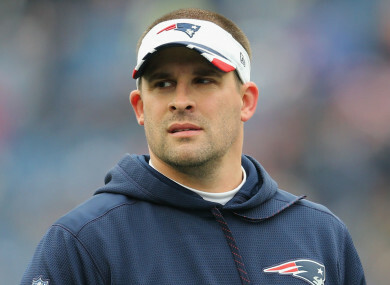 THE INDIANAPOLIS COLTS thought they had appointed New England Patriots offensive coordinator Josh McDaniels as their new head coach. The even went as far as making the announcement yesterday, just two days after McDaniels and the Patriots lost Super Bowl LII to the Philadelphia Eagles. However, just five hours later, McDaniels changed his mind and announced he was staying with New England. After agreeing to contract terms to become the Indianapolis Colts’ new head coach, New England Patriots assistant coach Josh McDaniels this evening informed us that he would not be joining our team,” the Colts said in a statement. Although McDaniels hadn’t signed a contract with the Colts, the team had scheduled his introductory news conference for Wednesday at Lucas Oil Stadium. Indy has also already signed a number of positional coaches — including former Cowboys’ linebacker coach Matt Eberflus as defensive coordinator — on the basis McDaniels was taking the job. Since joining the Patriots in 2001, McDaniels has helped the team to five Super Bowl victories, enjoying two spells as the offensive coordinator, and has been instrumental in mentoring Tom Brady. Why he has opted to change his mind remains unclear, but there have been suggestions for a number of weeks that New England head coach Bill Belichick is contemplating walking away and this decision will only add fuel to that fire. Email “5 hours after the Colts announced Josh McDaniels as their new head coach, he says he doesn't want the job”. Feedback on “5 hours after the Colts announced Josh McDaniels as their new head coach, he says he doesn't want the job”.